Former Parliamentarian Tiran Alles and ex-LTTEer Emil Kanthan are to be indicted over the massive financial fraud at the Reconstruction and Development Agency (RADA). Attorney General has recommended that a total of four persons, including Alles and Kanthan be indicted in the case. The recommendation was filed on Friday at the Colombo Fort Magistrate on the charges of misappropriating state funds. RADA under the Chairmanship of Alles is alleged to have obtained Rs. 645 million from the Treasury to build houses for tsunami victims. However no houses were constructed. In 2015, the Police confirmed that the funds collected by the organization were credited to Oomps textiles Ltd. – a fake company formed by three individuals identified as Shanthi Kumar, Gajan Kumar and their mother Anandi Shanthi Kumar. The Court was informed that through this company and two other bogus companies, a total of Rs. 125 million has been misappropriated. It was also mentioned that the State funds paid to Oomps Textiles Ltd. had been taken over by Alles and former LTTE-er Emil Kanthan. The Court last year banned Alles from leaving the country, along with five other suspects for their alleged involvement in the fraud. However, in June this year, considering Alles’s medical reports, the Colombo High Court granted him permission to travel to Singapore for medical treatment for a maximum of two weeks. However, when Alles travelled to Singapore for medical treatment later in June, he was refused entry by immigration authorities, and was compelled to take a return flight back to Sri Lanka. In 2012, through a US diplomatic cable it came to light that Alles had executed an affidavit detailing Basil Rajapaksa, Jayasundera and Weeratunga’s involvement in the arrangements with Emil Kanthan, who was a prominent Tamil businessman and suspected LTTE intelligence officer. Alles has deposited the original in a secure place accessible to his attorney. 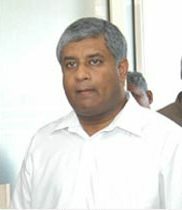 Further, Alles had recorded at least one of the meetings between Kanthan and Rajapaksa’s election team (Basil Rajapaksa, Jayasundera and Weeratunga) with his mobile phone’s video camera. A cheap way to get at Mahinda Rajapakse. It has to be a cheap way – that is the only MR can comprehend. Any Joker who want to accept responsibility for crimes committed on behalf of somebody, believing that person will return to power to bail them out, will be sadly mistaken and will rot in jail. Alles should be made an “offer he can’t refuse” to confess about Rajapakse (and his co-conspirators) bribing Prabhakaran to force the people in the North to boycott the election so Rajapakse could steal the Presidency. Time to end the fiasco and put the perpetrators away – for good! Mahinda Rajapaksa and Basil Rajapaksa? From where did the money come from? Money stolen from the people by Mahinda Rajapaksa and Basil Rajapaksa? Why go after the “Podians” . Go after the real culprits, Mahinda Rajapaksa and Basil Rajapaksa? This is a great speech we all need to think about this, think wise and flush them this time. RE: Tiran Alles And Emil Kanthan Faces Charges For Financing LTTE Interesting. Hats off to you, Anura, for your courage as we cannot see other politicians like you behaving bravely. Please take care as we feel that your life would be in peril from the corrupted leaders. God Bless You, We love You and your policy.﻿ Thank you. Not Basil Rajapakse, the principal shark???? Poor Sripathi Sooriyarachchi, who was killed in an ‘accident’ (https://www.youtube.com/watch?v=XPpNCaYMAU8). Come on, drag Basil and expose him. Enough is Enough!!! The dirtiest scoundrel out of the lot. There can`t be a worst sin than “Pillification” of tsunami money and nourishing LTTE terrorism with it. This shameless traitor should be punished by impaling him in public. Wonder what the Yahapalana Partner and the British Tiger Forum (BTF ) boss Suren Surendran has to say about this?.. If Kanthan is guilty of been an ex Tiger, what about Suren Surendran who is still a living Tiger..
And what would be this AG’s take on Mangalan the FM, and the current Leader of the UNP LGBT Faction?. Isn’t he a close associate of Mr Surendran who togetherwith Suren arranged finances to install Yahapalanam?. And even promised a Sanakeliya ( Carnival ) in the Megapolis to have a a LTTE Exhibition , right in the heart of the International Financial City Colombo, GFG?.. Wonder what you have to say about the involvement of your Godfather MR and his patriotic Clans involvement with the murderous LTTE? Have you any clue, about rigging the selection in 2005 by paying the LTTE? I would better advice you to scrutnize your loyality to MR before taking up with yahapalanaya & Co. I have noticed that you took a long Bypass to comment on the involvement of MR election Team in the news but worrying about Mangala and BTF. Somehow funny!!!! You conveniently left out Karuna, LTTE, still alive but was made a minister by the Rajapakse. When it comes to sleaze there is Sinhala-Tamil unity! Tiran was acting on the interests of the then desperate MR who wanted to rob the election from Ranil. They succeeded by doing business with the LTTE and financing it. This is illegal and MR , Basil and Gota must be all brought to book and prosecuted by the law. So much for their bloody patriotism. No wonder Wimal also belongs to this dirty gang. How many of our soldiers and innocent civilians would have died because of the money paid to the LTTE. If only the masses know of the real destruction that MR has caused to this land for generations to come. Alles, Basil & Jayasundara are free to walk around in freedom while their cases drag on for decades. They will die a natural death in freedom. Meanwhile LTTE foot soldiers mostly conscripted by ruthless VP are langusihing in jail for decades. Is there a money laundering issue in this whole sordid affair? Is there a ballot rigging case against MR, his clan and cronies, bribing the psychopath just before the elections in 2010? Is there a case against MR, his clan and cronies for funding and transacting with a internationally banned terrorist organisation? Is it possible to calculate the number of innocent people who were killed due to this extra financial stimulant from MR, his clan and cronies, a joint enterprise in terrorism? That is the difference between winning and losing. Those losers who did not get killed, should consider themselves lucky, if they get out after many years, because those they killed are dead and gone, but they are still living, being fed by the captors. So. Tiran noballs got the best mental treatment from Singapore government. . So the “Courts” allowed Alles to travel to Singapore to receive “Medical Treatment”; but refused entry to the country by the Immigration Authorities and was compelled to take the return flight to Sri Lanka. What happened to him after return? Did he receive that most urgent “Medical Treatment” in Sri Lanka? Is he well and truly in “Good Health”?. Here again our Courts must take a serious look at these “Medical Reports & Recommendations” given by our “Doctors”. What more to discuss, when even an accused IGP over a “Murder” case entered hospital even without the proper authorization by our Courts. Then again an accused who swindled Rs. 600 million from public funds, released on bail with strict conditions on foreign travel being granted permission to go abroad on a “PILGRIMAGE”. Who is FOOLING whom? Next govt will investigate dealings of Ravi Karunayake, Johnston Fernando, Mangala Samraweera and CBK with LTTE and LTTE Rump. Why didn’t the previous government investigate that ??? This is what Press freedom means in Sri lanka. No-name prestitiutes writing crap articles. This scoundrel should be behind bars. Mangala Samaraweera should be held responsible for introducing this unknown wheeler dealer to public life. He is a rogue and a liar. Mangala is still trying to protect him. Shame on you Mangala. Obviously he has something to hide. Alles’s are a disgrace. They attacked Ranil and now they are pleading with him for forgiveness. He even robbed money that was suppose to be given to the LTTE. Thank you for exposing this pervert. The arrests may have strong evidential basis but there is a smell of vengeance. Anyone feeling the stench? How come the Treasury releases funds to the Reconstruction and Development Agency (RADA) at the request of Tiran Alles? The earlier version was Mahinda Rajapaksa submitted a cabinet paper for Rs.500 million to put up houses for Tsunamy victims. The tender to construct the houses were given to bogus companies with addresses in Vavuniya. So which version is correct? MR won the election with a majority of 186,000 votes solely because the LTTE unofficially boycotted the presidential elections held in November 2005. TNA at that time told that people need not show interest in the elections. In the Kilinochchi electorate only one voter cast his vote. Where is Emil Kanthan now? There was an arrest warrant for him by the Interpol. Where is he now? Where is Tiran Alles? The whole RADA scenario stinks!!. 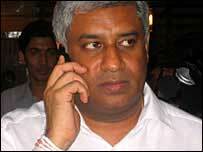 Hope Mangala Samaraweera stay out of the Investigations. No matter who gave leadership to the political battle to win the war. Behind every rupee given to LTTE blood of poor Lankans- Sinhalese, Tamils, Muslims were spilled. For that sake Alles should come clean. No Padyaathras will bring the corrupt ruler again. So Alles face the reality. To the rulers of the country tighten the rules so that they don’t make comments against the judiciary every time they make a trip to FCID of courts. Is there a way to haul the real culprits under PTA? If possible please do it. Though this comment below is not connected to the subject matter. Where the hell this guy Johnston Fernando who has not even completed his OL has such money to take his wife for treatment in Singapore? Could he give a tuition lesson? Lots of people like me cant afford even with degrees.